Yesterday marked the opening of Cruise Week in the UK, an event in which at least 2,000 UK travel agents will be participating. 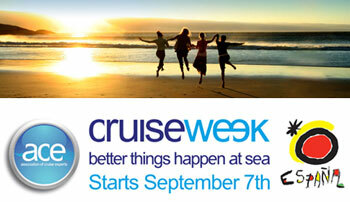 Although there have been Cruise Months in the UK before, this year sees the first Cruise Week. Described by the Passenger Shipping Association-backed training arm the Association of Cruise Experts as "the world's largest cruise campaign," it is based on the "World's Largest Cruise Night," an annual event sponsored by the Cruise Lines International Association in North America. At last year's event 1,000 North American agents hosted events that generated 17,000 bookings worth $22 million in sales and $3 million in commission. Cruise lines have been backing ACE in sending out special offers for Cruise Week and special kits to agents, including NCL who sent a whole travel agency decorating kit, including streamers, flags and balloons. And of course all the participating cruise lines (which is pretty well everyone) will be measuring the results in terms of bookings. In 2007, some 38 per cent of the UK cruise market were first-timers so it is this sort of clientele at whom the week is aimed. The Leading Cruise Agents of the UK is backing up ACE with a month-long national advertising campaign in The Sunday Times, The Mail on Sunday and The Daily Telegraph, which will see half a dozen cruise line associate members and a dozen of its agent members advertising together, a first in the cruise industry. ACE itself will be running a Road Show at London Gatwick Airport tomorrow, one of several nationwide, at which agents will be trained in how to sell cruising and a grouping of twenty-five cruise lines, tour operators and destinations will run a trade show. Travel Weekly will be the media sponsor for that event and keynote speaker will be Carnival UK chief commercial officer Peter Shanks, to whom Carol Marlow, president of Cunard now reports. Other shows being mounted by travel agents range from "cruises from the Tyne" to the usual luxury shows, cocktail parties and individual agent events with Crystal, Fred Olsen, Hurtigruten, Silversea and Thomson, to name just a few of the lines being offered. Venues vary across the range from golf clubs and garden centres to yacht clubs, airport hotels and shopping centres. In an increasingly tough economy, where the UK is variously reported to be on the verge of recession, cruising has proven to be a product that can hold its own - with growth of more than 10% still predicted still above 10% for this year. The strength of the market is reflected in the expansion of cruise retailers in the UK. Fred Olsen's Go Cruise franchise operation has been opening new branches around the UK. Because of the growth in the cruise market, Bath Travel of Bournemouth, whose offices account for about £60 million in annual cruise bookings, is opening a new office, its 67th, in Britain's main cruise port of Southampton. And Gill's Cruise Centre in Cardiff has opened something called the Baker Street Cruise Club in London. Indeed, P&O Cruises made the point last week that a two-week cruise is cheaper now than it was ten years ago. NCL's Colin Veitch had already made that regarding cruises in general, pointing out that they were cheaper now than twenty-five years ago at Cruise-A-Thon Vancouver in May. At the same time, cruise lines offering seven-category upgrades, free children and even free flights to the Antarctic, combined with all the new ship introductions this year, is stoking the fires of cruising - and air fares, hotel and resort prices tend generally to go up and not down. And air lines might fail, but generally cruise fares are protected. And as ships gets bigger, Oasis of the Seas went on sale last week - all 5,400 of her berths in cabins, suites and lofts - promotion of the cruise product continues. "A bronze statue of Mark Twain now sits in the main lobby of the Princess Hotel. Not far away, on Front Street where Mark Twain and millions since have docked, Hamilton used to see a hundred or more calls a year. This year, it will see but eleven. While there is a plan to build a new Hamilton cruise terminal at Albuoy Point, near the present ferry terminal, it doesn't seem to be an active one and one can't help feeling that something has been lost her of an honourable past that runs all the way back to 1874 - that people could walk off their ships and be right in town." Well, it seems that the Bermudian Government has recognized that abandoning Front Street was not a good idea. A little over two weeks after The Cruise Examiner's column appeared, i.e. on September 4, Holland America Line announced that they would be placing their 1,266-berth Veendam on the New York-Hamilton run, with a second call at St George's, in August 2009. "Veendam's guests are able to step off the ship right in the centre of each town. Ships larger than Veendam must tie up at the Dockyard facility a considerable distance from both towns. With overnight stays in Hamilton and St George's, guests will truly have the time to explore Bermuda and gain an appreciation of its culture, its people and its history." Further good news may be contained in reports in Bermuda's "Royal Gazette" that the Government is also speaking to lines such as Celebrity and MSC about bringing more ships back to Front Street. However, the only Celebrity ships that fit the less than 750-foot rule are the 684-berth Azamara twins and the only MSC ship that does after the sale of the Rhapsody will be the 1,098-berth Melody, a ship that was actually built for the Front Street run as Home Lines' Atlantic in 1982. Bermuda Transportation Coordinator Larry Jacobs last week told the "Royal Gazette": "We are in talks with cruise lines and hope to make an announcement shortly. We intend to update the public on the status of discussions," said Mr. Jacobs. "What we are aiming for is 2010, which will give the cruise lines an opportunity to do their scheduling and marketing well in advance."